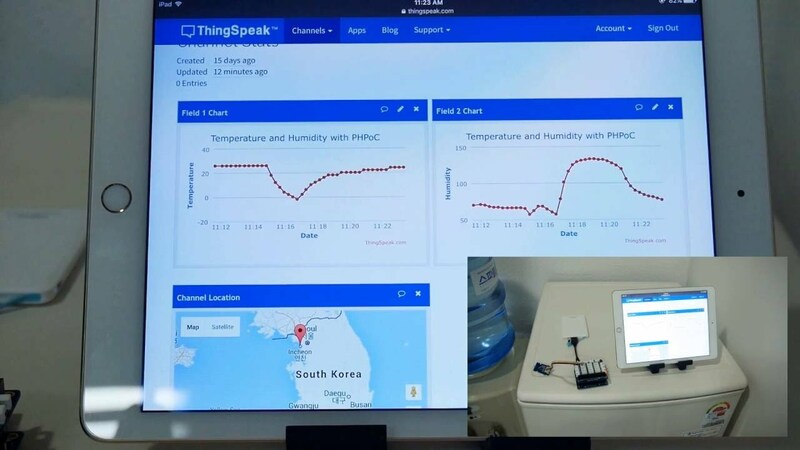 This project shows how PHPoC Blue reads data from Temperature and Humidity sensor and then send these values to ThingSpeak. Temperature and Humidity sensor (one of three: TH02, HDC1000, HTS221). Grove expansion board for PHPoC (Optional). Expansion board for Click boards (optional). Create a ThingSpeak account (visit https://thingspeak.com/users/sign_up ). Write down your channel id, Write API Key, Read API Key. vn_thingspeak.php: update/get data to/from your channel. vd_th02.php: library for TH02 temp&humi sensor. vd_hdc1000.php: library for HDC1000 temp&humi sensor. vd_hts221.php: library for HTS221 temp&humi sensor. *@param: $post_msg: Raw URL to write to ThingSpeak as a String. See the documentation at https://thingspeak.com/docs/channels#update_feed. *@param: $value: Value to write (any type). ThingSpeak limits this field to 255 bytes. *@remark: Visit https://thingspeak.com/docs/channels for more information about channels, API keys, and fields. ThingSpeak limits the number of writes to a channel to once every 15 seconds. *@param: $value: value to write (any type). ThingSpeak limits this to 255 bytes. *@param: $status: String to write (UTF8). ThingSpeak limits this to 255 bytes. *@param: $created_at Desired timestamp to be included with the channel update as a String. The timestamp string must be in the ISO 8601 format. Example "2017-03-23T13:59:59"
*@remark: Timezones can be set using the timezone hour offset parameter. For example, a timestamp for Eastern Standard Time is: "2017-01-12 13:22:54-05". If no timezone hour offset parameter is used, UTC time is assumed. *@return: Value read (UTF8 string). An empty string is returned if there was no status written to the channel or in case of an error. Use getLastthingspeak_read_status() to get more specific information. *@return: Value read (UTF8 string). An empty string is returned if there was no created-at timestamp written to the channel or in case of an error. Use getLastthingspeak_read_status() to get more specific information. define("AVERAGE_REG", 0x10); // To configure humidity/temperature average. Open web browser, access to your channel (https://thingspeak.com/channels/YOURID and see result. For my case, I put the sensor to fridge for some minutes. you can see result in demo part. Last edited by Khanh; 02-27-2018, 03:36 PM. All times are GMT+9. This page was generated at 05:46 AM.